The last time around at Shady Maple Smorgasbord, the GF and I stopped by the Lancaster area to brunch on down-home Pennsylvania Dutch breakfast eats. This time, we brought her folks out to the area to show that Pennsylvania isn't just Philly city living. 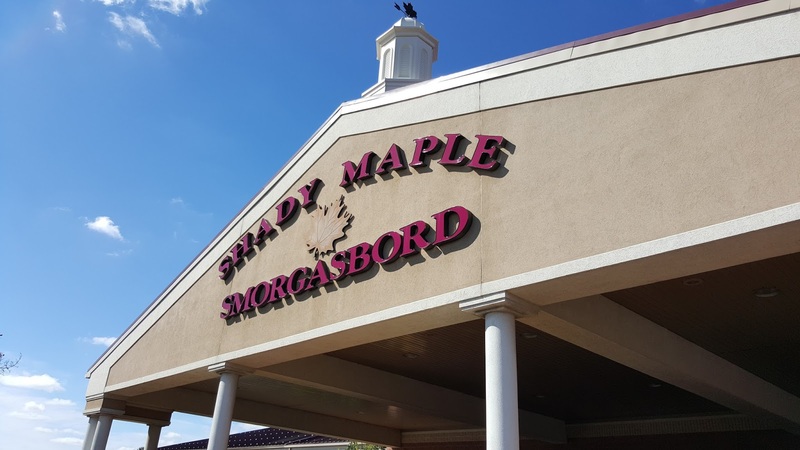 In addition to actual greenery (farms, pastures, cows, and the like), we were able to enjoy some lunch at Shady Maple. And by some lunch, I mean troughs full of it. Perfect for the belly of this pig. You know the deal with buffets. Endless lines of including carving stations for your meats, grilled items, seafood, sides, and desserts. It still amazes me how quickly they turn around each item - you rarely find that anything has been sitting our for long. Perhaps it's a testament to the number of people that come here on a weekend or the quality of their grub. In any case, I give you my 4+ plates on this particular visit. And no, I don't know how it all fit. And yes, there's a reason why there's one common thread throughout all the non-dessert platters (the mac was just that good!). My first plate featured broasted chicken - a new term for me, though I can't believe I've been missing this all my life. Incredibly crisp and wonderfully moist, the fried chicken was on point. The mac n cheese was nicely creamy, featuring sharp cheddar. While the shredded roast beef was tender, it could have been seasoned a bit more. But I'm nit picking here - it's a freakin' buffet! Plate 2 is what I call my surf and more turf plate. 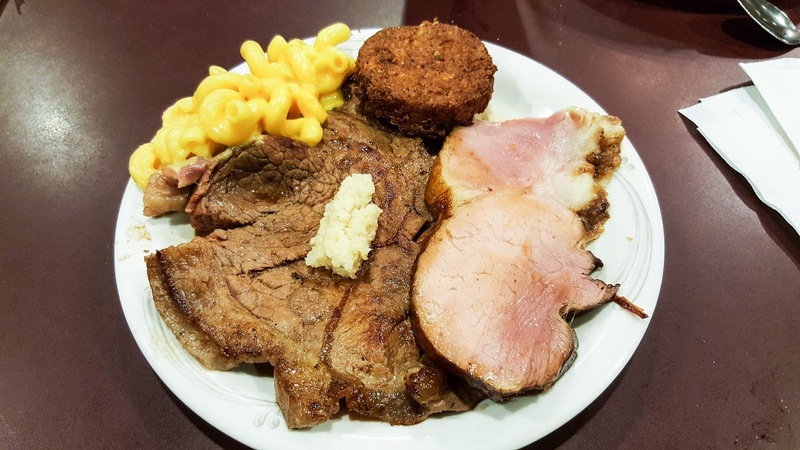 I had a huge slab of sirloin, along with some moist country ham and a crisp crab cake. And yes, some more of that mac! 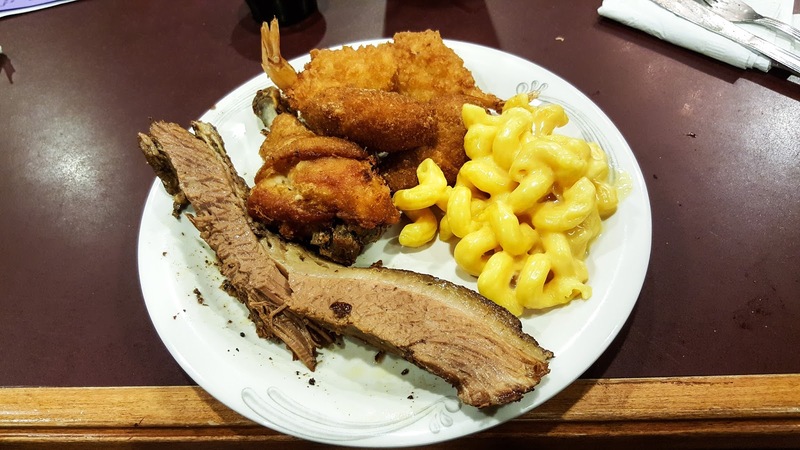 For plate 3, I finally realized there was brisket on offer so I obviously had to get some of that! 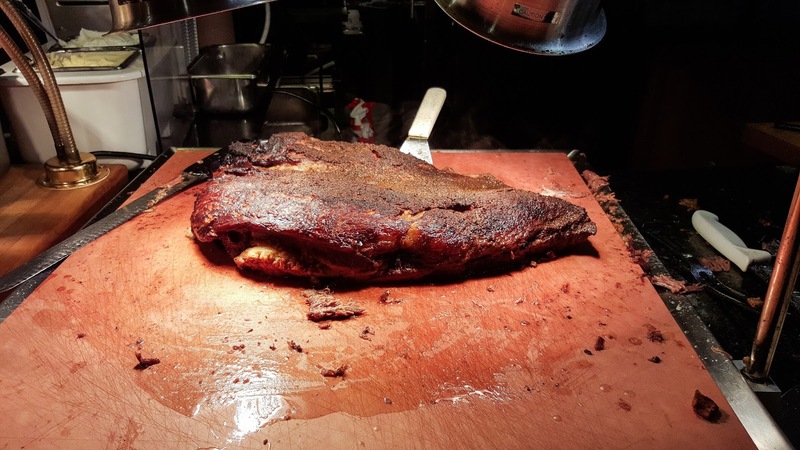 The brisket was wonderfully tender and unctuous, cutting like butter. 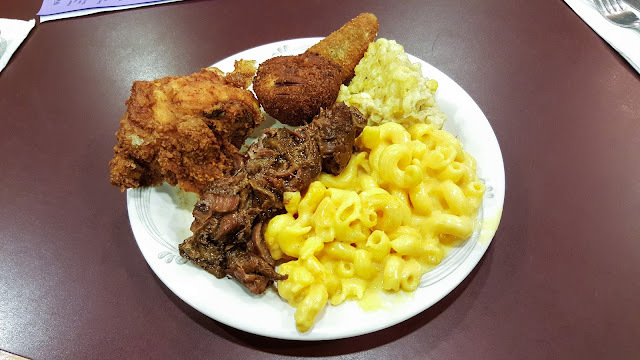 Along with some fried shrimp and some more of that broasted chicken and mac, I was set with my savory dishes! Shady Maple features Turkey Hill ice cream and they typically have vanilla, cookies and cream (with real Oreo chunks! ), as well as seasonal varieties like pumpkin since it's the Fall. 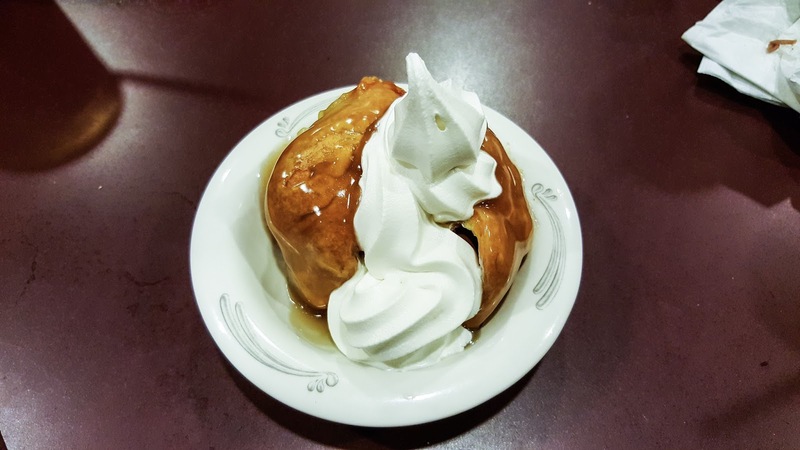 They've also got a number of other desserts from pies and cakes to this apple dumpling, which I topped with vanilla soft serve. Homemade, crusty, buttery, and filled with baked apples, this wasn't a bad way to end a glut of a meal. Look. Haute cuisine this is not. We're talking about stretchy pants and gym kicks here. 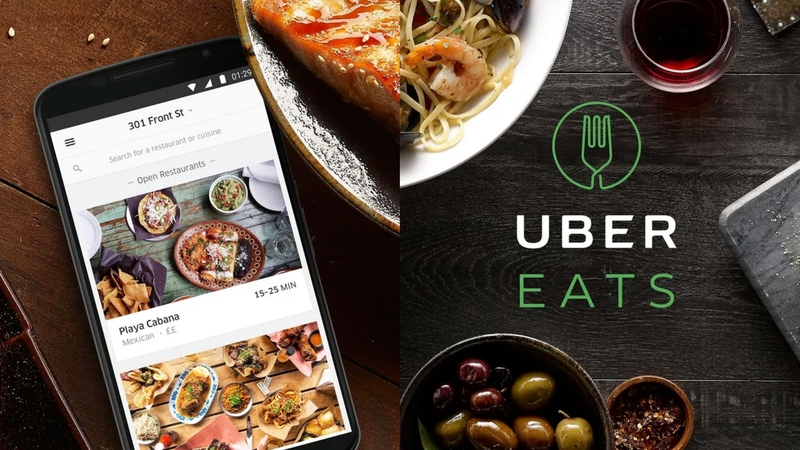 But that doesn't mean the food can't be good. Most of it is "low and slow" down-home cooking. And you can always find me in line for that.